Do you remember your first date? Your first kiss? I don't know. I'm not sure I can really pin it down. My story is a little confusing. I was confused. Is this a date? Is this a kiss? Is this how it works? Does this "count"? My story involves a production of Romeo and Juliet. Tank Girl. Nachos. Broken glasses. It was all a little strange and I had a lot of questions no one could really answer. The Doctor had a lot of questions too. He wasn't programmed for this. (I wasn't either, really.) So when a brilliant, interesting, charming woman shows up, and captures his holographic heart, what's he supposed to do? The woman in question is Denara Pel. She just happens to have the Vidiian Phage but (thanks to an implant already jammed in her head) they capture her mind digitally and stick it in a holographic body. Denara's a doctor too. She's been working to treat and cure the disease that's ravaged her people and herself. She and The Doctor have a lot in common. They're really into looking at blood scans and dissecting stuff and talking about epidemiology. As they spend more time together, Denara finds a new zest for life. She's had the phage since she was a child so, like The Doctor, she doesn't have a lot of life experience. No dates. No kisses. They're both a little afraid. At first, The Doctor is even resistant to his newfound emotions. He's worried there's a glitch in his program. But, after a chat with Kes and Paris, he finally comes around. Denara and The Doctor experience this romantic life stuff together. 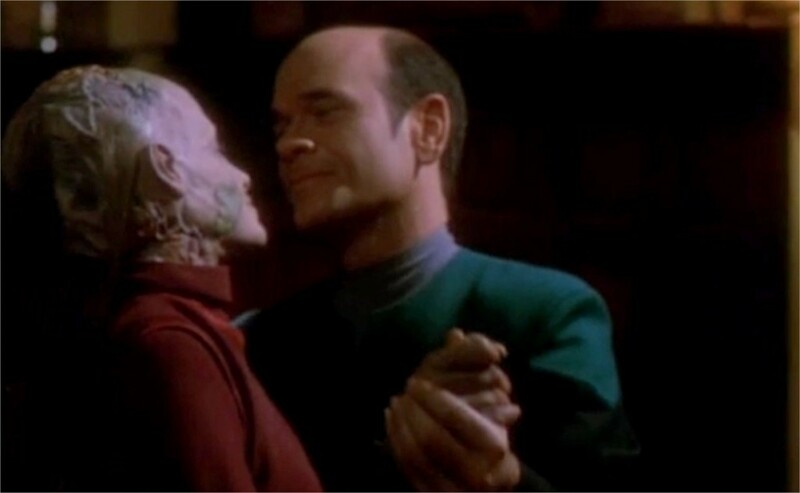 Because they're both limited by their holographic forms, they can only go between Sickbay and the holodeck but that means they can dance in Marseilles. 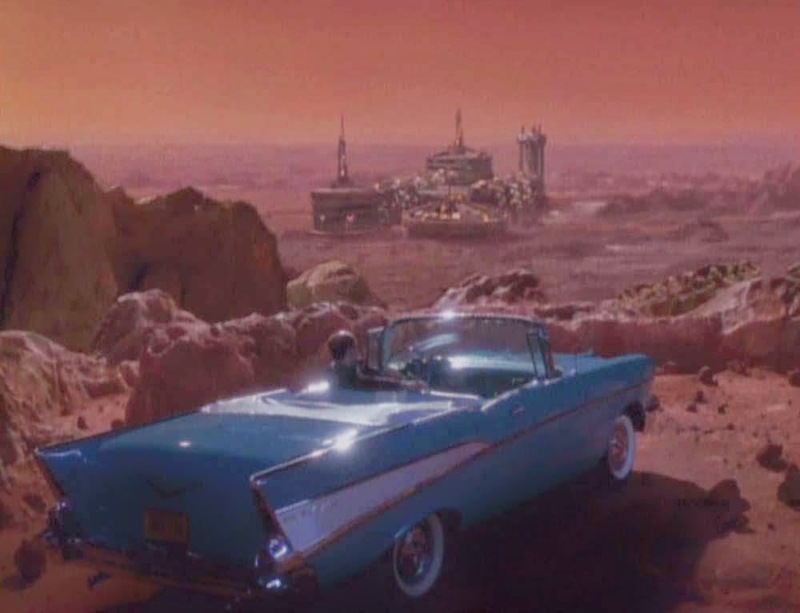 They can park on Mars. They can listen to romantic music in an old convertible while they share their first kiss. It's great. Actually, it's so great that Denara Pel doesn't want to go back to her real body--even when she knows her brain's pattern will degrade in the buffer. She's had enough of living with her disease, of being shunned and unable to live the kind of life she's had over the last few days. And, she's afraid The Doctor won't feel the same about her once she's back in her diseased body. But... of course he will. And that's one of the things I love about this episode. Just as The Doctor doesn't have any experience with love, he also doesn't have any experience with fear or disgust or exclusion. He's programmed with the absolute optimism of The Federation's belief system. He can't even fathom not loving Denara Pel--no matter what she looks like or how sick she gets. 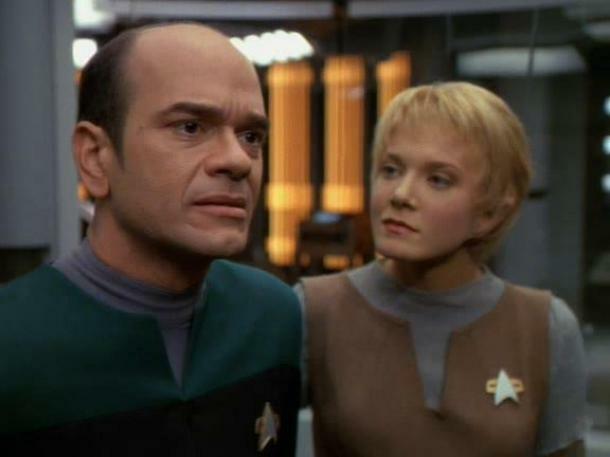 In the end, we have to remember that, unless it's between two regular/semi-regular cast members, Star Trek relationships don't end well. This is a One Off Romance. Though Denara Pel will make an additional (and important) appearance later, she simply can't stick around. She goes back to her body and, soon, she'll have to go back to her life, her people. But, before that, she and The Doctor have one last dance and it's lovely. -Cards on the table. I love accordion music. If I could play any instrument... ok it'd be violin. But if I could play any two instruments? Number two would definitely be accordion. -This episode has a lot of accordion music. -The Doctor sort of did this whole episode already in Heroes and Demons but (while I love that one) it didn't have the same emotional punch that Lifesigns does. -The Doctor learns to dance in this episode--a skill he'll later put to use with Seven.